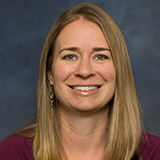 Dr. Kim Westermann is an assistant professor of Accounting in the Orfalea College of Business. She grew up in Southern California and graduated from Cal Poly with a Bachelor of Science degree in accounting in 2000. She worked for Ernst & Young in San Jose, Calif. as an audit senior. Dr. Westermann subsequently relocated to New York City, taking a job with PricewaterhouseCoopers, ending her career in public accounting as a full time instructor in PwC’s Learning and Education division. In 2006, she entered the inaugural cohort of the Bentley University Ph.D. program and was selected as the Henry E. Rauch Doctoral Fellow recipient. She has also been awarded the PwC INQuires Grant for proposals in 2007 and 2008. In 2009, Dr. Westermann was a visiting scholar and lecturer at the University of New South Wales in Sydney, Australia. After graduating in 2011, she spent four years as an assistant professor in Miami at Florida International University. She serves on the editorial review boards for Auditing: A Journal of Practice and Theory, Issues in Accounting Education, and Accounting and the Public Interest. Dr. Westermann was selected to serve as a national co-chairman for the Deloitte Trueblood Seminar for Professors. Dr. Westermann is interested in a variety of qualitative methods and conducts research examining auditor perspectives within their social context. Dr. Westermann has published in Contemporary Accounting Research, Auditing: A Journal of Practice and Theory, and Issues in Accounting Education. Her in-process research is rooted within sociology and organizational behavior literatures, examining both audit practitioners and clients about their perspectives on current issues (e.g., professional skepticism, PCAOB standards) in auditing. Westermann, K., J. Cohen, and G. Trompeter. 2018. PCAOB Inspections: Public Accounting Firms on “Trial.” Contemporary Accounting Research. Forthcoming. Andiola, L., J. Bedard, and K. Westermann. 2018. It’s not my fault! : Insights into subordinate auditors’ attributions and emotions following audit review. Auditing: A Journal of Practice & Theory. Forthcoming. Bedard, J., R. Hoitash, U. Hoitash, K.Westermann. 2012. Material Weakness Remediation and Earnings Quality: A Detailed Examination by Type of Control Deficiency. Auditing: A Journal of Practice & Theory 31(1): 57-78. Westermann, K., J.C. Bedard, and C. Earley. 2015. Learning the “Craft” of Auditing: A Dynamic View of Auditors’ On-the-job Learning. Contemporary Accounting Research 32 (3): 864-896. Schnader, A., K. Westermann, D. Hanes, and J. C. Thibodeau. 2016. Training Teacher-Scholars: A Mentorship Approach. Issues in Accounting Education. 31 (2):171-190.